Exclusive 8, 5 or 3 Easy Payments ⚡ Electro-Voice ZLX12P 12 Inch 2-Way 1000W Full Range Powered Loudspeaker only at AMS! Free 2 Day Shipping ⚡ Free Extended Warranty ⚡ Call our Gear Experts at 800-319-9043 for expert advice! 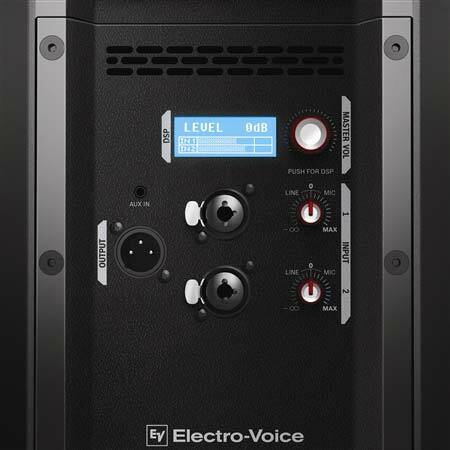 Speakers produced by Electro-Voice have been amongst the most popular on the market for decades, positioning them as one of THE premier voices in professional sound reinforcement. Their ZLX series is continues that trend. 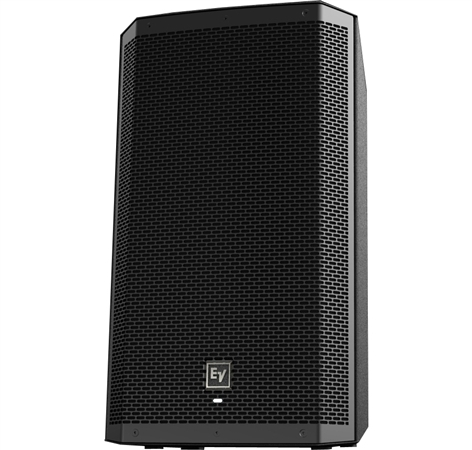 combining EV's proprietary drivers and top-flight DSP with loads of power to produce a box that excels as a front-of-house PA speaker, a wedge monitor, a DJ rig, a stand-alone PA box, or in a permanent installation. Two new Bluetooth® audio streaming “BT” models – ZLX-12BT (12-inch 2-way) and ZLX-15BT (15-inch 2-way) – combine the superior components, coverage and clarity of the standard ZLX models with the latest Bluetooth technology to deliver the lowest-noise, highest-fidelity streaming experience in their class – wireless convenience with Electro-Voice sound quality. Already own a standard ZLX model? Connect a “BT” model for wireless stereo Bluetooth streaming! High-efficiency 1000 W Class-D power amplifiers delivering up to 127 dB peak SPL utilizing transducers designed and engineered by EV. Clean sound, all the way up to maximum output. Single-knob QuickSmart DSP control with LCD display — optimize ZLX to suit your style and space. QuickSmart DSP processing: Easy application/location setup via four presets, sub/top system-match, two-band EQ, five user-programmable presets, visual monitoring of limiter status, input level control and meters, and master volume control to optimize gain structure. Lightweight, super-durable composite construction with three-handle design for effortless pole mounting and portability. With its stunning – and often imitated -- enclosure design, ZLX looks as good as it sounds. EV patented Signal Synchronized Transducers (SST) waveguide design provides precise and consistent coverage, minimal distortion, and maximized acoustical loading. Available in 12” and 15” powered and passive versions, ZLX makes it easier than ever to own and experience premium professional audio. Its combination of streamlined industrial design, compact size, user-friendly operation and portability, and plentiful power have made it a great value choice for monitors and mains in DJ/musician applications such as practice spaces and small clubs, and perfect for basic installations and portable multi-purpose sound. The worldwide #1 best-selling portable PA speaker – ZLX’s unparalleled combination of performance, features and user-friendly operation have made it the proven global go-to for affordable professional sound quality – excellent all-around value from a real pro audio brand. Often imitated, never equaled – Since launching, ZLX’s compact, ergonomic and lightweight three-handle enclosure design has been imitated by many of our competitors, but guess what? What’s inside the box makes a big difference too, and ZLX wins when it comes to sound quality -- read the customer reviews! The game-changing feature set that put ZLX on the map – Best-in-class across every detail, with high-quality EV-engineered components, QuickSmart DSP with single-knob controller, EV-patented Signal Synchronized Transducers (SST) waveguide design, three-handle enclosure design, and more. Pro features in a portable package. Over 90 years of know-how in every box – With such an extensive track record of proven audio innovation, it’s safe to say that Electro-Voice has a deep understanding of what goes into making good sound. Where our competitors often rely on off-the-shelf components from third-party manufacturers, EV stands apart as one of the few pro audio brands to design and engineer its drivers and woofers in-house from the ground up. Our transducers are legendary for their sound quality and reliability, but it doesn’t stop there. From our invention of the humbucking coil back in 1934 to our latest patents, EV continues to push the parameters of what is possible in sound reinforcement, utilizing the industry’s most sophisticated design software, most extreme measurement processes and most grueling physical tolerance tests to take the performance of our products to the next level. ZLX encapsulates EV’s heritage of engineering excellence, making those decades of audio know-how more accessible than ever before. Energy-efficient engineering with no compromises in performance – EV is renowned for the quality of engineering that we put into everything we make, at every price point, for every application. ZLX represents that commitment. Our products are designed and tested above and beyond industry norms to achieve the highest levels of performance with the latest transducer and amplifier technology. We stand behind the specs we publish with our products. The “Big Wattage” numbers that most manufacturers publish to sell their speakers have little to do with what actually matters: acoustic output. Many customers perceive high wattage ratings as a key selling point. 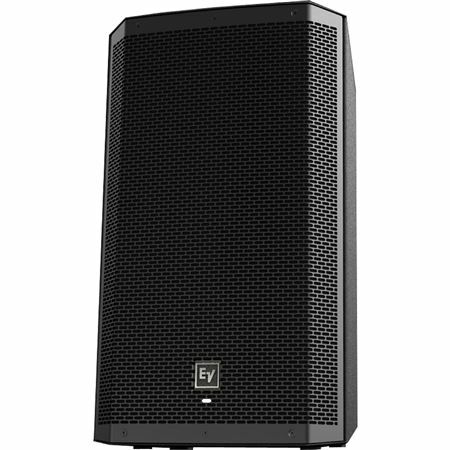 However, EV’s goal with powered speakers – in which the internal components are designed to work together optimally to achieve the desired level of performance in a given format/class at a given price point -- is achieving sustained maximum SPL with minimal distortion – superior all-around acoustic performance at the system’s highest output capacity. The quality of our engineering means we can reach the same high SPLs with full bandwidth sound quality while using less wattage – we continuously strive to evolve energy-efficient speaker design. Many loudspeaker manufacturers boast of super-high wattage numbers, but their products simply don't sound good when pushed to their upper limits of their stated output capacity, with distortion being the main issue. ZLX will sound powerful, crisp and clean, even at its highest volume. 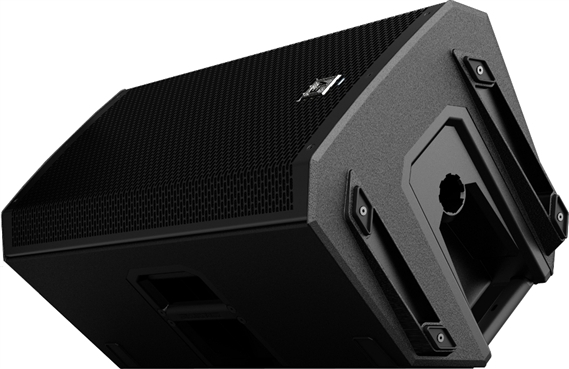 Delivering performance well beyond what you’d expect from a speaker of this size, the ZLX12P produces an impressive 1000 watts for a maximum SPL of 126 dB. Consistent coverage is realized courtesy of ZLX’s Constant Directivity Waveguide’s firm control of the high frequencies, while Electro-Voice’s patented split-baffle design of the ZLX keeps a tight rein on phase cancellation anomalies. Optimized driver time-alignment maximizes direct impact from 50 Hz – 20 kHz, delivering uniform response across the audible frequency spectrum. Weighing in at just over 34 lbs, the lightweight, resilient composite-constructed enclosure features top and side-mounted “Hi-Low” grips for easy transport and pole mounting, and the black powder-coated 18-gauge steel grille securely protects the components within. 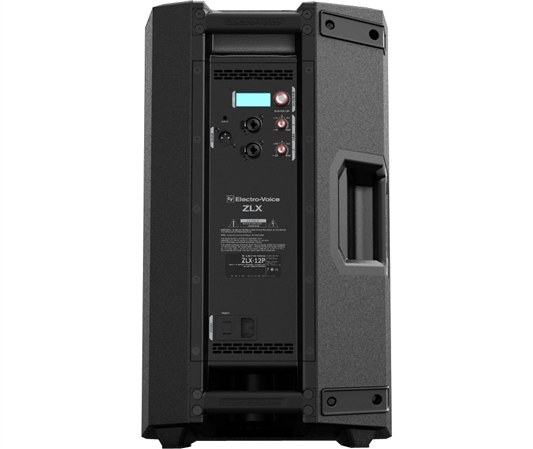 Loaded with a 12” Electro-Voice EVS-12K woofer, the ZLX12P is capable of reproducing low-frequency tones all the way down to 50 Hz. The high end is handled by EV’s 1.5” high-frequency titanium compression driver, the DH-1K, and extends up to 20 kHz. The powerful 1000-watt Class-D amplifier offers an abundance of headroom yet is extremely light, contributing to the exceptional portability of this cabinet. Beneath the clean and sleek back panel lies a wealth of processing power. Use the one-touch knob (defaults to Master Volume) to scroll through and select ZLX12P’s menu options as they appear on the bright blue LCD screen. Here you’ll find handy presets that optimize the cabinet for music, live, speech, and club use. Two dual-function XLR-1/4” combo jacks with independent gain controls guarantee compatibility with the most popular plug types and just about any input level. And the 3.5 mm input jack is perfect for connecting a tablet or phone for simple audio playback. There’s even a male XLR output for daisy-chaining multiple cabinets together with ease. 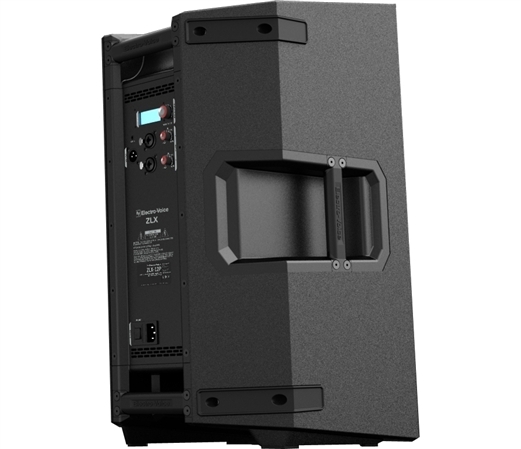 A rugged, compact, reliable and powerful sound reinforcement solution, the versatile ZLX-12P outperforms everything else in its class. Electro-Voice boasts that ZLX are “The best-selling speakers in the world.” With such a comprehensive and advanced set of features, we’ve no reason to doubt them. I got these to use as sidewash monitors for the band, but they are better than my mains. I used them to play music at practice, and picked up drum parts I didn't hear on my other speakers. I am very happy with them! These are great speakers. The quality and sound is good! I love these speakers! Love the compact size and light weight of these speakers. A few tweaking but they sound great. Bought to go alongside the Evolve 50 also by EV. Hands down best tops for the price!